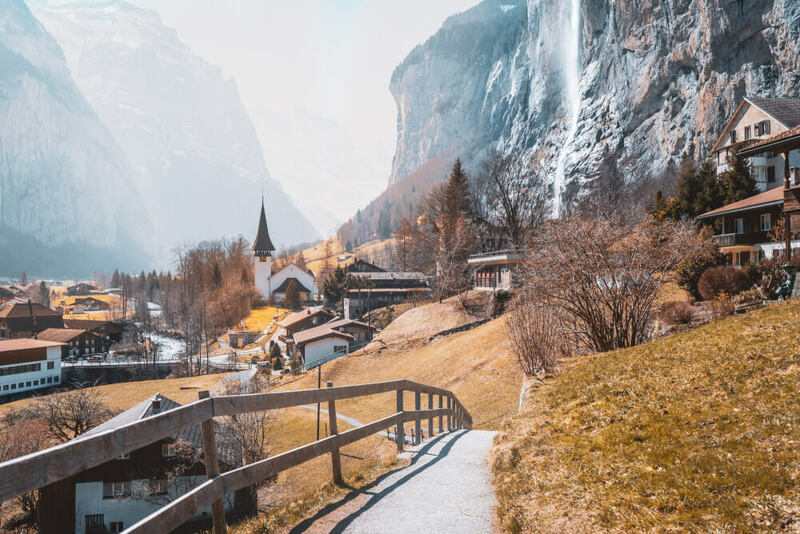 The picturesque town of Lauterbrunnen, Switzerland, nestled at the bottom of the Lauterbrunnen Valley, is one of those Swiss destinations that you see a photo of and bam – that’s it: your life mission is now to frolic in it. That’s the kind of power Lauterbrunnen had over me, anyway… and so it has dutifully haunted me from the deepest depths of every Pinterest board for, I kid you not, years. That’s why, when the opportunity presented itself for me to FINALLY visit Lauterbrunnen, I jumped, nay – I freestyle danced – for joy. Planning my trip wasn’t easy though. I quickly realized just how little information there was about actual things to do in Lauterbrunnen, or practical tips at all (besides a healthy smattering of swoonworthy photos of course). Alpine meadows, dramatic rockfaces, dozens of waterfalls, and more… Lauterbrunnen is one of those places so scenic it looks made up. And fittingly so, it was during a hike here in his youth that J.R.R. Tolkien was inspired to create Rivendell, land of the elves in his *cough* mildly famous book series, Lord of the Rings. And the resemblance isn’t tough to see. The natural beauty of the Lauterbrunnen Valley is staggering. And while there’s not a ton to DO necessarily in Lauterbrunnen, it’s a wonderful little place to reconnect with nature, and remind yourself just how beautiful Planet Earth can be. Lauterbrunnen is located pretty much smack dab in the middle of Switzerland. 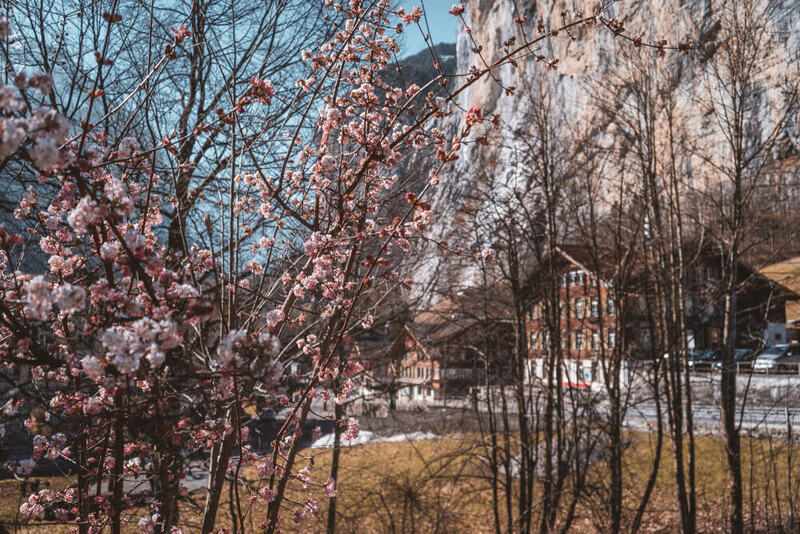 Getting here directly from any big city is probably not going to happen – virtually all trains will connect via Interlaken Ost, but it’s a short ride from there to Lauterbrunnen, and within 20 minutes, you’ll be skipping along the scenic trails of the town in no time. 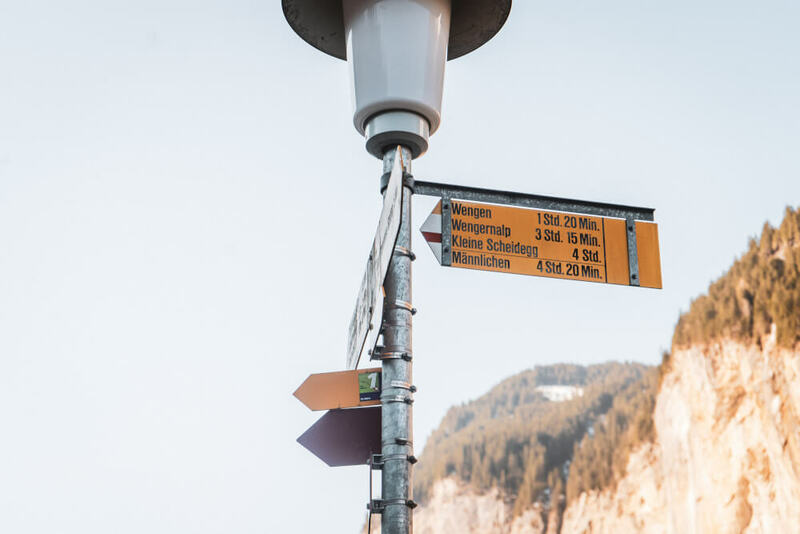 TIP: To search up all the different routes/possibilities to get you to Lauterbrunnen from your start point, check out Omio! It’s a free service that allows you to compare/book options all in one place. 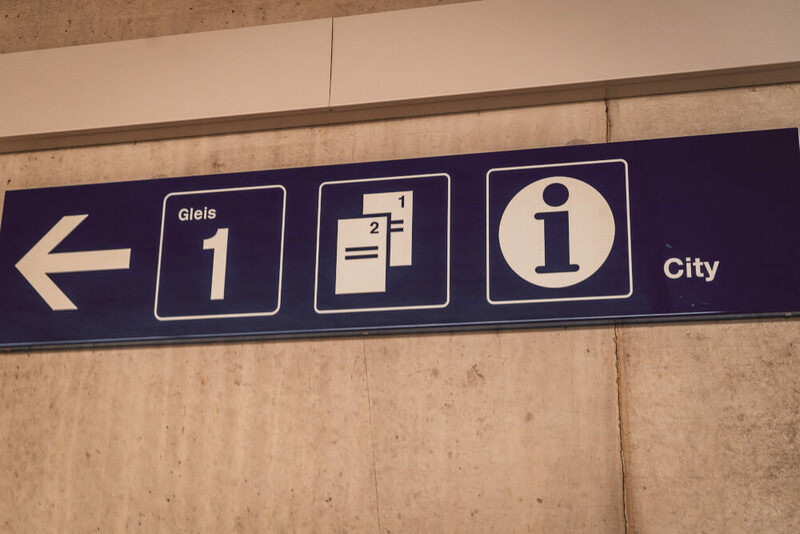 Once you arrive at the Lauterbrunnen train station, look out for signs that say “City” and follow them. 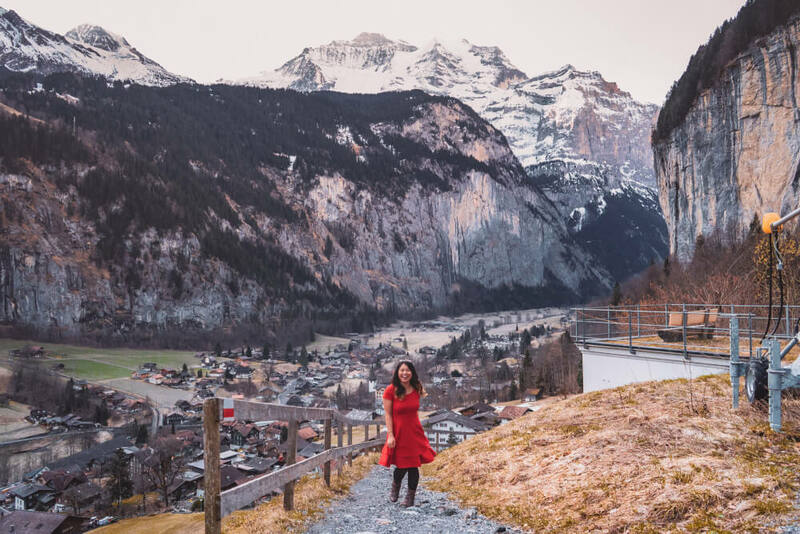 You’ll need to follow a path uphill to reach the main stretch, and then boom – you’re on the main street in Lauterbrunnen and ready to skip around like the overexcited puppy you’ll soon become. 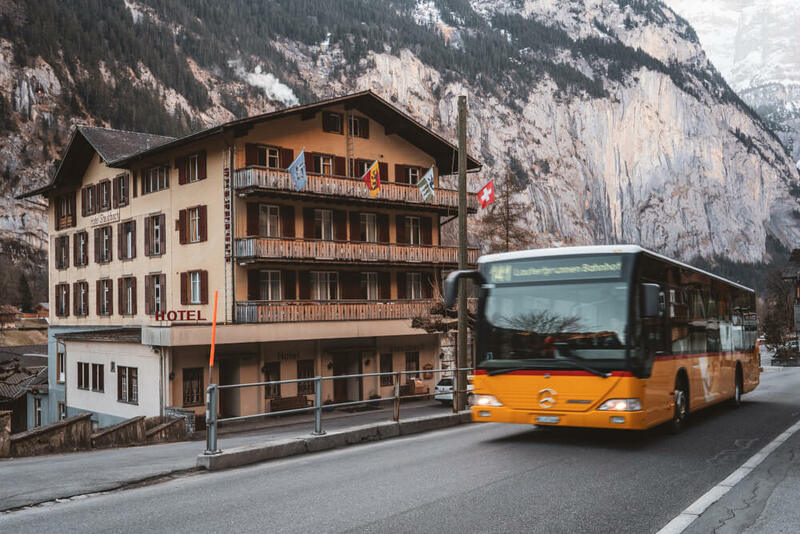 For a town of its size, there are actually quite a few Lauterbrunnen hotel options to choose from. If you’re on a budget, I can recommend Hotel Hornerpub, which offers ridiculously cheap rooms for 40CHF a night! This is where I stayed, and I even got a waterfall view for that price. It’s located above the only pub in town so it’s far from glamorous, and you have a shared bathroom to work with, but the rooms are cozy, well-heated, super comfortable and excellent value for money. Click here to check reviews and availability. They also offer apartments if you want something bigger (and with a private bathroom). Click here to check reviews and availability on those. Hotel Staubbach is another great choice offering AMAZING views over town and the Staubbach Falls. 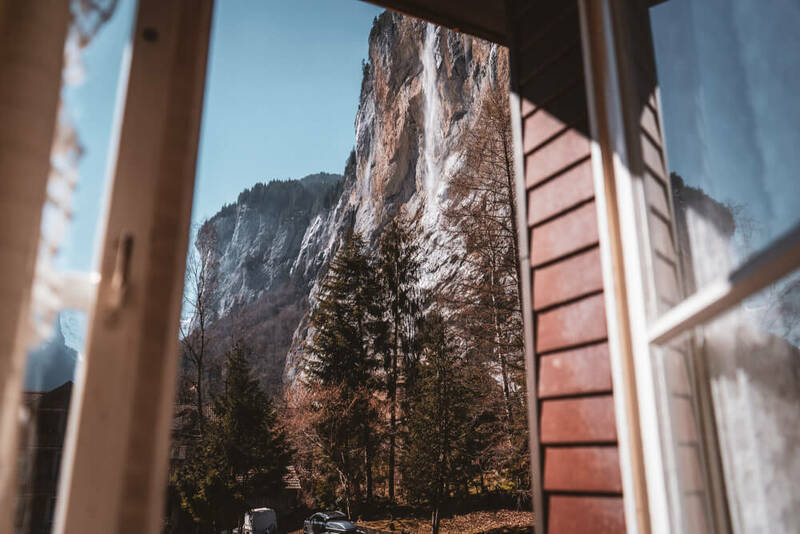 They’re one of the first hotels ever established in Lauterbrunnen, and offer highly-praised hospitality in addition to a free breakfast included in your rate. Click here for prices and availability. 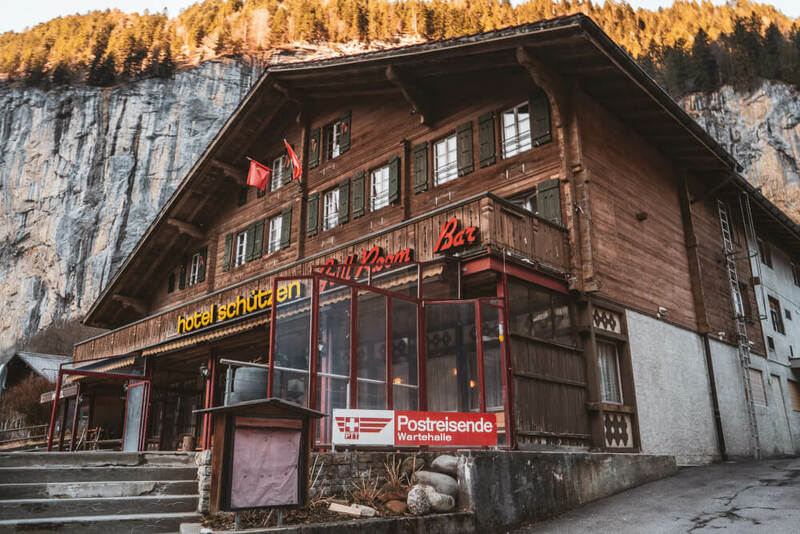 Last but not least, if you’re looking for hotels in Lauterbrunnen near the train station, Hotel Oberland is a quick walk from the station, and offers a delicious on-site restaurant along with cozy, Swiss decor. They book out quickly though as they’re also very affordable, so click here for prices and availability. If you’d prefer to stay in a hostel for budget or for social reasons, I’ve heard great things about the Valley Hostel. A friend of mine even called this the hostel that turned her into a backpacker! 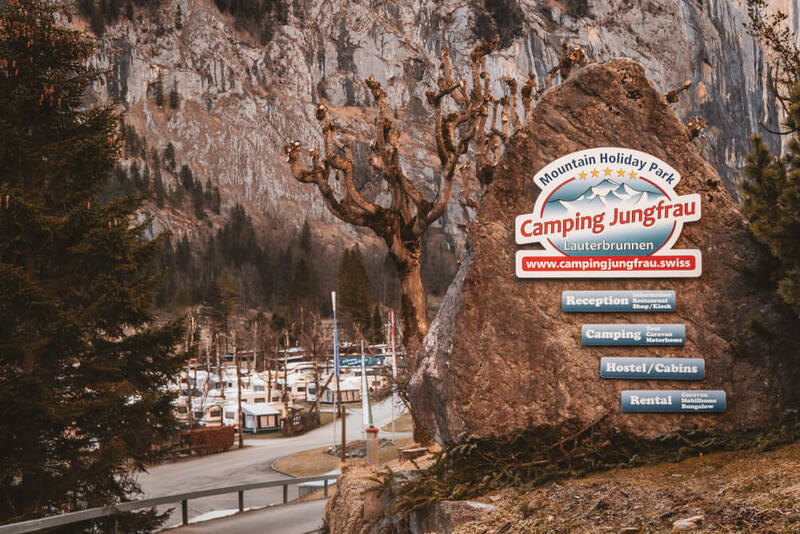 If you’re looking for a budget-friendly place to stay, Lauterbrunnen is home to a big campsite called Camping Jungfrau that is located just steps away from Staubbach Falls and includes a wide range of options including bungalows, dorms and even cottages. While it’s not in the very center of Lauterbrunnen, it’s a short and scenic 15 minute walk from the train station. There’s also an on-site supermarket and restaurant, plus a shuttle service if you need. NOTE: Camping Jungfrau is a very popular choice so book as early as you can. Click here for reviews and availability. At the same time though, unless you’re into outdoor activities, you won’t find a ton to actually do here. 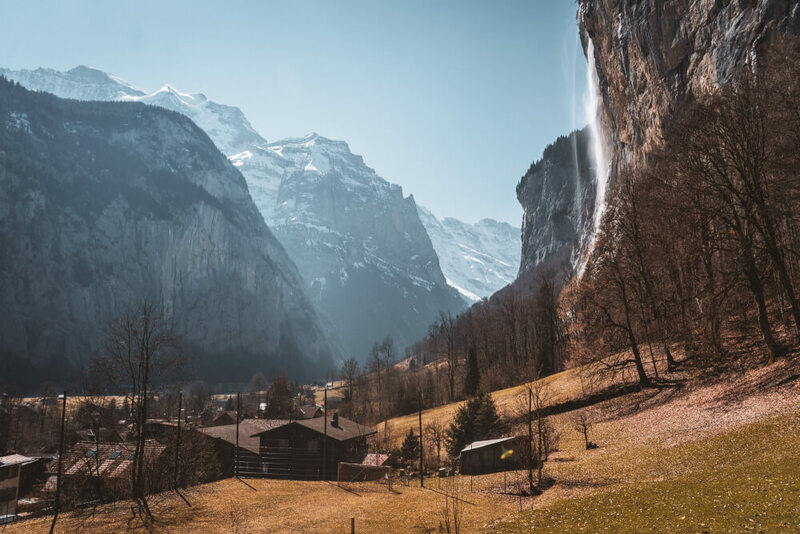 The main activities available to you in Lauterbrunnen involve hiking, waterfall chasing, or other outdoorsy things, and the actual town itself does not have much to offer besides a handful of hotels and restaurants. Keep that in mind! If you’re looking for a livelier place to stay with a bustling nightlife or plenty of attractions to keep you occupied, it might be smarter to stay elsewhere. I was shocked to discover during my research that accommodation prices in Lauterbrunnen were substantially cheaper than nearby cities. I for example was able to score a waterfall-view room for only 40CHF at Hotel Hornerpub! Granted, it was far from glamorous and there was a shared bathroom, but the room was private and honestly you won’t find a better deal anywhere in Switzerland. There are also some hostels and cheap hotels in the area that are very reasonably priced, relative to the rest of the country anyway. 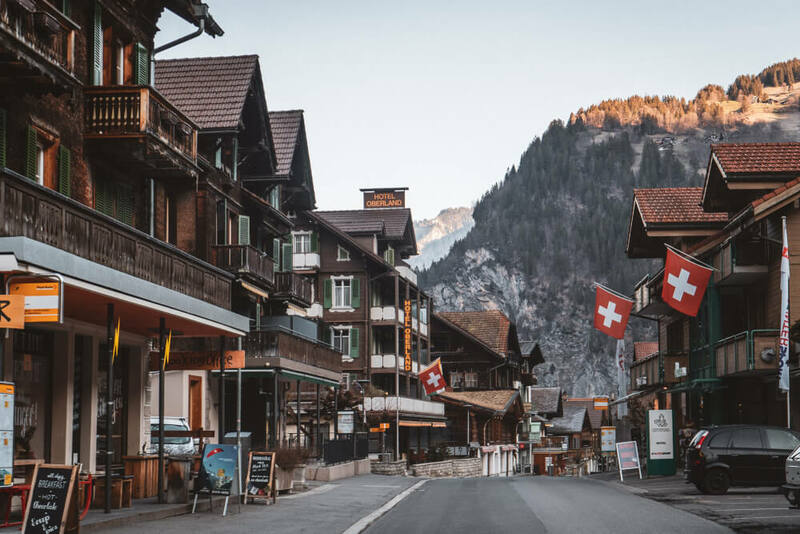 In a town as small as Lauterbrunnen, often there isn’t a lot of information available on activities, museums, attractions, and above all else, their opening times. That’s why I would suggest you pop into the Tourist Information Center in Lauterbrunnen to ask about hikes, viewpoints, activities, etc. They are really nice there and a great help. 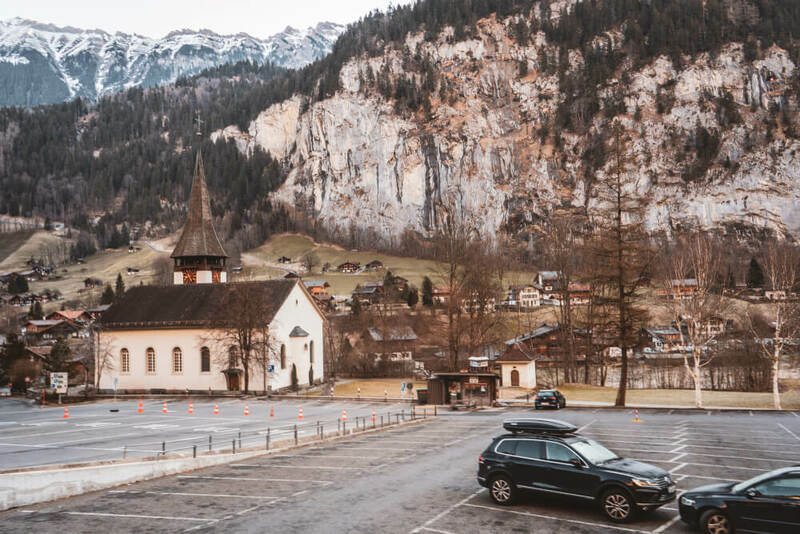 If arriving by car, you can relax – I noticed a lot of Lauterbrunnen parking options, a surprising amount actually given how small the town is. Not only was there a huge multi-story car park behind the train station, there was also a big lot near the church in the center of town, and of course a lot of parking available for private hotels too. My rule of thumb when I’m in a new place is usually to wake up at sunrise and explore before all the crowds rush in. I followed this protocol for Lauterbrunnen, only to (dumbly) realize: duh, Lauterbrunnen is in a valley, so the town doesn’t get any sun until 2.5-3 hours after sunrise! I did still explore and liked seeing the town so empty, but the town had this dark shadow over it that didn’t entirely do it justice…. This sounds like basic advice but WOW the signage at the train station is confusing. They have a bunch of symbols but the part that says “City” is written in very small print and easy to miss. If you exit and you see a big car park in front of you, you’ve come out the wrong way. Turn around, and come out through the other side, then follow the path uphill to get onto the main street. The train station exit is actually on a lower level than the main strip, so you’ll need to walk up to reach it. I visited at the end of March, which is still off-season for Lauterbrunnen. It was good because prices were low and there weren’t many crowds, but on the other hand, the beautiful flowers hadn’t bloomed yet and many of the attractions (like the Trummelbach Falls) weren’t yet open. The weather also wasn’t super ideal yet for hiking. If I were to plan my trip again, I think I would want to come back in the summer, when all the alpine meadows are filled with flowers, and most importantly: adorable cows! Last but not least, I want to mention one thing I observed in Lauterbrunnen. Perhaps it’s just me, but I got an overall vibe that local townspeople weren’t too thrilled with tourists bumbling about. On a few of my explorations, I had my tripod out and was walking some trails to get nice viewpoints over town (not going onto private property of course!) Without fail, every single local I said hello to did not say hello back, and kind of looked at me with disdain. I mean, in a quaint and quiet town like this, I can imagine the influx of tourists hasn’t necessarily been a welcome change, but that still made me a little bit sad. So, remember, if you’re visiting, don’t expect to be embraced warmly by every local you meet, but also remember to be respectful and not give them any reason to dislike the tourism! To get to this viewpoint, just follow the main road in town and walk towards the falls. 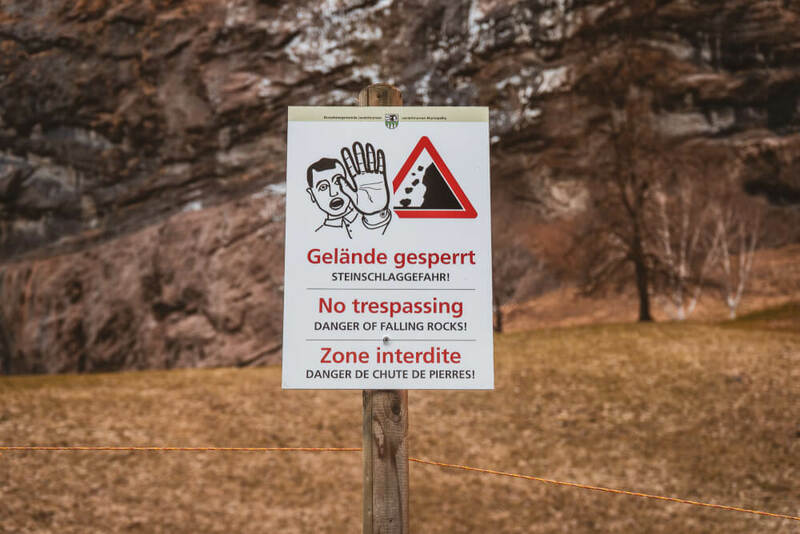 You’ll soon see a barn that has “Staubbach falls” marked on it, and to your right you’ll see a path that goes upwards towards the viewpoint. Of course, you shouldn’t limit your Lauterbrunnen waterfall chasing to only the Staubbach Falls! 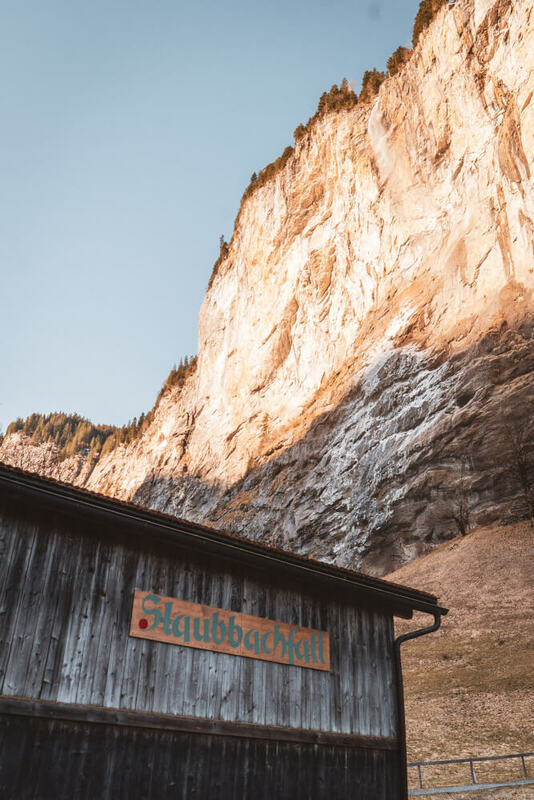 In the summer months, the Trümmelbach Falls open for business, and they’re another classic Lauterbrunnen must-see. While they sadly weren’t open during my visit, they’re nonetheless something I’d recommend you check out because I’ve heard nothing but rave reviews. Basically, the Trümmelbach Falls are a series of 10 glacial waterfalls hidden inside a mountain, made accessible to the public through a series of tunnels and lifts. Awesome right? Click here for more info. Next, one of the best things to do in Lauterbrunnen is to go hiking. All around town, you’ll find bright yellow signs that point you towards different trails, so you have no excuse 😉 I hiked a small portion of the hike to Mürren and the views were stunning, although most prefer to take the cable car up and hike down instead. The way up IS fairly steep, so I would recommend that alternative if you’re not looking for an intense workout. Click here for a list of Lauterbrunnen hiking trails you can try out! Lauterbrunnen, without exaggeration, is just one massive photogenic wonderland. If you love taking photos as much as I do, then you’ll soon discover that there’s zero shortage of beautiful corners and details to photograph. You can click here to read my roundup of favourite views in Lauterbrunnen! 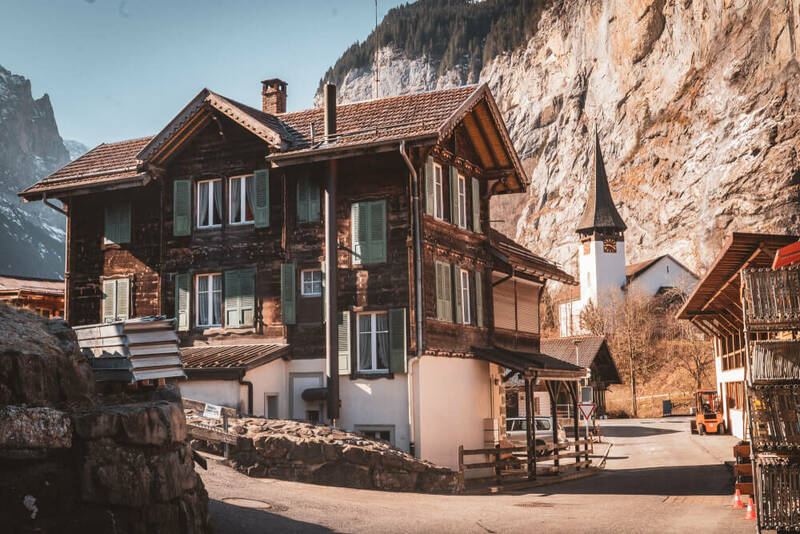 If you’re looking for a rainy day activity or just curious to learn more about the local history/culture of Lauterbrunnen, you can pop into the little Lauterbrunnen Valley Museum, with various displays including vintage skis and a hotel room set-up from the 1900s. … Okay, so it might not sound like the most exhilarating of all things to do in Lauterbrunnen, but I wanted to diversify this list a little. Sue me. Lace making has been part of Lauterbrunnen’s local traditions since the 17th century, and visitors now have the unique opportunity to learn more about it for free through weekly workshops and demos. You can find more details here. Lauterbrunnen is well-known as a global hub for BASE jumping, the (dangerous) extreme sport which involves throwing oneself off a fixed object (e.g. cliff, building, etc.) with a parachute or wingsuit. I’m not sure I could ever do it, but if this is the kind of adrenaline rush you’re looking for, BASE jumping is definitely one of THE Lauterbrunnen things to do. You can click here for a guide to BASE jumping in Lauterbrunnen, written by a former local. If it’s a nice view and an easy hike you’re after, take the affordable cable car from the Lauterbrunnen village up to Grütschalp, where there are a variety of easy and flat hiking trails you can enjoy. You can click here to learn more about opening/closing times. If you want a cool, unique view over the Lauterbrunnen valley, the short train ride up to Wengen is a good alternative to hiking! I did this trip and really enjoyed the views as we climbed up the valley, although to be honest, there’s not a ton going on in Wengen besides the ski resort. 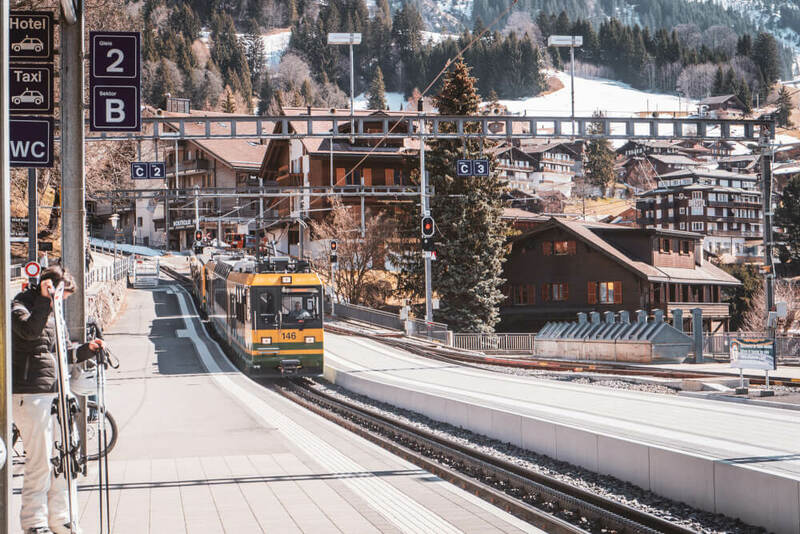 If you’d really like to make an adventure out of this, extend your trip and go all the way up to Jungfraujoch, the highest train station in Europe! Last but not least, after a long day of sightseeing and running around, I could definitely understand if you’re craving a drink to enjoy. Well, the good news for indecisive folks is that Lauterbrunnen is so tiny, it only has one pub!! So, hop on over to the Hornerpub if you’re looking to grab a drink with tourists and locals alike. Curious about how Lauterbrunnen is looking at the moment? You can scope out a live Lauterbrunnen webcam here. Any more questions about Lauterbrunnen, Switzerland? 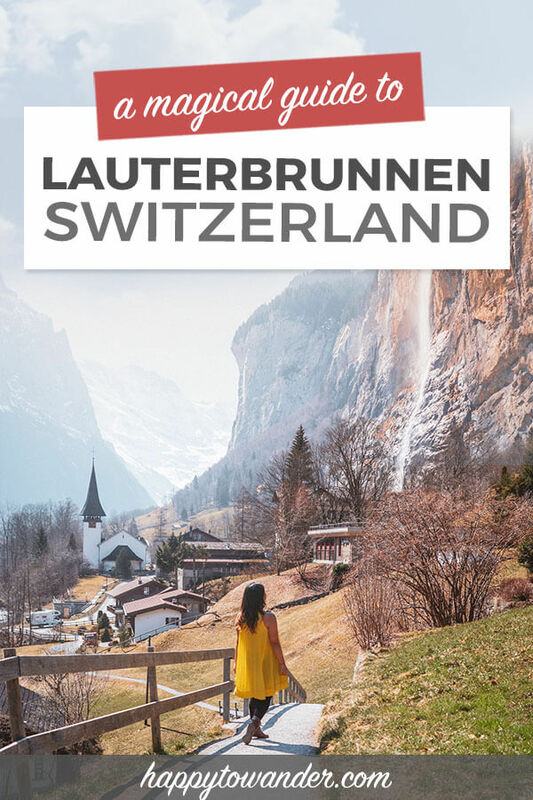 I hope you enjoyed this guide to Lauterbrunnen, and that it helps you out with planning your trip. Safe travels! AH MAH GAHD, Lauterbrunnen has been on my list for a little while but I’ve never read up on it! Absolutely GOT to go there, I mean if I start walking tonight……. it’ll be worth it, right?! 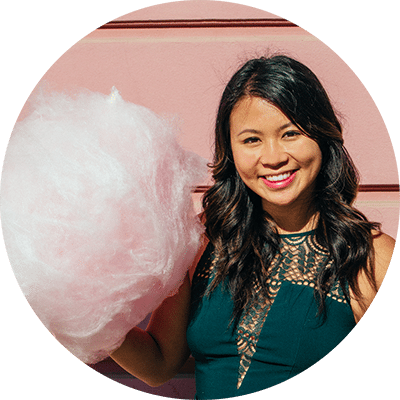 Well, this post has come at the best time – I’m headed to Switzerland next month and I’m trying to finalize my itinerary. You’ve listed such a great bunch of activities and it looks so beautiful! I hope that in May I’ll get some of the blooms that you mentioned. I’ve never even heard of Lauterbrunnen! ITS SO TINYYY!! But you made it sound really cool! I’m in! This was such a thorough, yet personal and interesting guide. I read it because I’ve been researching summer vacation spots in Europe and Switzerland is slowly creeping up the list! I think I’d probably take a car though so I can dip in and out of towns when I finish. I would love to do some hiking around here. Thanks for the tips. I stayed in Lauterbrunnen when visiting Jungfraujoch and can confirm that it is an awesome activity to take the train all the way up! There’s also a lot of fun things to do up there, not to mention the incredible views from the top as well as the ones you’ll see from the train over the Lauterbrunnen valley. Such a gorgeous town. Added to my bucketlist. 🙂 I don’t know if I have the ovaries to base jump though haha! I love the honesty of your post Christina! We camped here two years ago were astonished at just how beautiful it is. But I’d have to agree there are not many attractions here to tick off, if this is what you enjoy most. Instead, I’d really recommend it as a base for some serious hiking, which is what we did here – fabulous day walks to Gimmelwald, Murren, Wengen and Kleine Scheidegg. 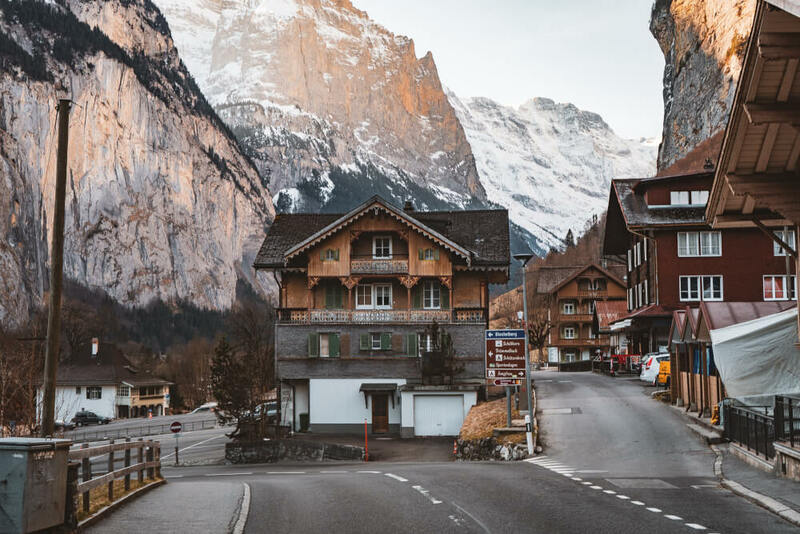 The village of Lauterbrunnen is quiet, and not as touristy as I expected – but we’d thoroughly recommend the lovely Airtime cafe if you’re staying here or passing through.